Flora 27, Bes. Beil. : 1 (1844). Sclerocarya caffra Sond. (1850), Poupartia caffra (Sond.) H.Perrier (1944), Poupartia birrea (A.Rich.) Aubrév. (1950). Marula, cider tree (En). Prunier d'Afrique, sclérocarya à bière, prunier jaune (Fr). Canhoeiro, morula (Po). Mng'ongo, mng'ong'o, morula, mungango (Sw). Marula occurs throughout most of sub-Saharan Africa outside the humid forest zone, from Mauritania and Senegal to Ethiopia and Eritrea, south to Namibia, Botswana, Zimbabwe, Mozambique, South Africa and Swaziland. It is also present, possibly introduced, in Madagascar and has been introduced to Mauritius and Réunion. It is grown as an experimental crop in Israel and has been introduced to Australia, India and Oman. Marula provides diverse benefits at subsistence level and yields traded, and increasingly commercialized, commodities. The main product is the fruit (‘marula plum’), a dietary item for over 10,000 years. The flesh of the raw fruits is consumed, the skin being discarded, or the juice sucked from them. Kernels extracted from the fruits are also eaten raw. Fermenting the fruit at household level produces an alcoholic beverage (‘marula beer’) which is either consumed directly or distilled into a strong liqueur. The boiled juice is used to flavour and sweeten porridge. The kernels are crushed and used to make cakes or biscuits or as a soup ingredient, or oil is extracted from them and used as a meat preservative. The oil is also used for cooking and skin care. Considerable medicinal significance is attached to the tree, especially its bark (including that from roots) and leaves. Conditions treated with decoctions or pastes containing bark or leaf ingredients include infections and parasitic diseases, problems with the digestive tract and injuries. Bark decoctions are administered orally or as enemas to treat diarrhoea and dysentery. They are also used to treat stomach ailments, fever and ulcers. Roots are used to treat sore eyes. The skin of the fruit is used to treat blisters caused by hairy caterpillars. Sclerocarya birrea foliage is eaten by livestock although it is never a major source of browse. Apart from fallen fruits, use is intermittent except in times of general feed shortage when herdsmen lop branches to make foliage accessible. Additional livestock benefits are shade from the tree and the quality of forage grasses beneath it. The tree yields a utility timber which was commercially important in the past (Senegal, South Africa). The ease of working the wood with simple tools, combined with its large size for a dryland tree, explains its traditional popularity for the production of mortars, bowls and drums. It is also used as fuelwood. In South Africa, the bark is used to prepare a mauve, pink, brown or red dye, the colour depending on methods used. Ink has been made by dissolving gum from the bark in water and adding soot. Over the last 20 years, commercial products from southern Africa based on marula fruits have been marketed. Most prominent is a liqueur (‘amarula’) but a beer, wine and pasteurized juice have also been produced. There have been initiatives to market jams and jellies with marula as the characteristic ingredient. Marula oil is extracted for export as a cosmetic product in Namibia. Commercial use probably accounts for well over 600 t of juice per year. There are high ascorbic acid concentrations in the fruit skin (150–250 mg/100 g), flesh (150–400 mg/100 g) and juice (100–200 mg/100 g). Kernels contain per 100 g dry matter: protein (20–35 g), fat (55–65 g), phosphorus (0.7–1.9 g) and have an energy value of 25 MJ/kg. The oil is rich in oleic acid (64–74.5 g/100 g) which gives good oxidative stability, palmitic acid (11–17.5 g/100 g), stearic acid (5–11 g/100 g) and linoleic acid (4–9 g/100 g). The main amino acids are glutamic acid (18–27 g/100 g protein), arginine (11–16 g/100 g protein) and aspartic acid (5.5–8 g/100 g protein). The potent tyrosinase inhibitor 2-hydroxy-4-methoxybenzaldehyde has been isolated from marula bark, and also (–)-epicatechin-3-galloyl ester, which showed secretagogue activity on rat colon. Bark and leaf extracts showed antibacterial activity against Enterococcus faecalis, ethnobotanical use of marula for bacteria-related diseases. In West Africa, the fodder contains per 100 g dry matter: calcium (3.1 g), magnesium (2.4 g) and potassium (1.2 g). Low values of crude protein (8.3 g) and digestible protein (4.7 g) and a low nutritional ratio (4.7 g digestible protein associated with 630 kJ net energy per 100 g dry matter) signify poor fodder quality. The sapwood is thin and paler than the pale pinkish to pale reddish-brown heartwood. The wood texture is coarse but even; the air-dry density is 590 kg/m³. However, strength of the wood is low, durability poor, and the wood is liable to distort during drying. In South Africa its use was banned in 1962 when the tree became protected. Usually dioecious, small to medium-sized tree, usually 9–12 m tall but occasionally up to 18 m, with a taproot and sturdy lateral roots extending as far as 30 m; bole short (usually ca. 4 m), up to 120 cm in diameter; bark pale silvery or purplish-grey on small individuals, rough on large individuals, with flat, roundish scales; crown rounded, with rather dense foliage, spreading widely in large, old trees; branchlets stout, the leaves clustered at the ends. Leaves alternate, 8–38 cm long, imparipinnate with 3-18 pairs of leaflets; stipules absent; petiole, rachis and petiolules glabrous, channelled; lateral leaflets subsessile or with petiolules up to 3 cm long, terminal leaflet with a petiolule up to 5 cm, leaflets round to oblong-elliptical or elliptical, 1–9 cm × 0.5–3.5 cm, length increasing up the rachis, asymmetrical and cuneate or rounded at base, obtuse, acute, acuminate or acuminate-caudate at apex, margin entire or (in juvenile state) dentate-serrate, glabrous, with 6–16 pairs of lateral veins. Male inflorescence a terminal or axillary, drooping raceme 5–22 cm long, with flowers in groups of 3–4 towards the base but solitary towards the apex; female inflorescence reduced, subterminal and spiciform, with 1–2(–3) flowers. Flowers unisexual, regular, 4–5-merous; pedicel 0.5–5 mm long in male flowers, 0.5–1 mm long in female flowers; sepals free or almost free, ovate-round, 2–3.5 mm × 1–2.5 mm, spreading, usually reddish; petals free, obovate to oblong-ovate, 4–6 mm × 2.5–4 mm, becoming reflexed in male flowers, remaining erect in female flowers, yellowish to reddish; male flowers with (10–)15–25(–30) stamens 3–4 mm long, inserted round a subentire, yellow disk; female flowers with a superior, subglobular, 2–3(–4)-celled ovary immersed in the disk, crowned by 2–3 short, lateral styles ending in a capitate stigma, and 15–26 staminodes. Fruit an obovoid to subglobular drupe 3–3.5 cm in diameter, yellow at maturity, on a 10–15 mm long pedicel; skin thick, mesocarp fibrous, fleshy and juicy and adherent to the hard stone 2.5–3 cm × 1.5–2.5 cm with (1–)3(–4) compartments, each with a flattened seed. Seeds obclavate, compressed, 15–20 mm × 4–8 mm × 2.5 mm, with papyraceous brownish testa; cotyledons plano-convex. Seedling with first leaves trifoliolate having sessile, pinnately veined leaflets with dentate margins. Sclerocarya is a strictly African/Madagascan genus and all closely related genera are African. It is closely related to Poupartia, a Madagascan and Indian Ocean genus of 5 species into which Sclerocarya is sometimes sunk. Sclerocarya comprises only 2 species, Sclerocarya gillettii Kokwaro being a small tree or shrub endemic to Kenya. Three subspecies of Sclerocarya birrea are distinguished: subsp. birrea, subsp. caffra (Sond.) Kokwaro and subsp. multifoliolata (Engl.) Kokwaro. Subsp. caffra occurs widely in southern Africa and is distinguished by its acuminate or cuspidate leaflets and by its lower leaflets having petiolules 5–30 mm long (in subsp. birrea leaflets obtuse to acute and petiolules up to 5 mm). The large number of leaflets, (25–)29–37, distinguish subsp. multifoliolata, which is restricted to Tanzania, perhaps also in Kenya. Subsp. birrea occurs north of the equator and extends south into Kenya and Tanzania. 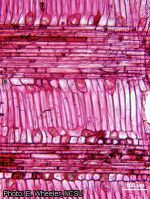 Growth rings: 2: growth ring boundaries indistinct or absent. Vessels: 5: wood diffuse-porous; 13: simple perforation plates; 22: intervessel pits alternate; 23: shape of alternate pits polygonal; 26: intervessel pits medium (7–10 μm); 27: intervessel pits large (≥ 10 μm); 31: vessel-ray pits with much reduced borders to apparently simple: pits rounded or angular; 32: vessel-ray pits with much reduced borders to apparently simple: pits horizontal (scalariform, gash-like) to vertical (palisade); 42: mean tangential diameter of vessel lumina 100–200 μm; 47: 5–20 vessels per square millimetre. 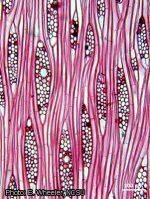 Tracheids and fibres: 61: fibres with simple to minutely bordered pits; 65: septate fibres present; 68: fibres very thin-walled; 69: fibres thin- to thick-walled. Axial parenchyma: 75: axial parenchyma absent or extremely rare; 78: axial parenchyma scanty paratracheal; 92: four (3–4) cells per parenchyma strand. Rays: 97: ray width 1–3 cells; 106: body ray cells procumbent with one row of upright and/or square marginal cells; (107: body ray cells procumbent with mostly 2–4 rows of upright and/or square marginal cells); 115: 4–12 rays per mm. Secretory elements and cambial variants: 130: radial canals. Mineral inclusions: 136: prismatic crystals present; 137: prismatic crystals in upright and/or square ray cells; (156: crystals in enlarged cells). Marula is fast growing, reaching 3.5 m in 8 years on the 600 mm mean annual rainfall isohyet (Bambey, Niamey). Mean heights and diameters of planted trees 4–5 years old in Israel were 4.1–6.2 m and 13–18 cm (30 cm from the ground), respectively. Wild trees in Mali, estimated 11–12 years and 32 years old, were 8.2 m and 6.9 m tall and 28 cm and 45 cm in diameter, respectively. The trees can be coppiced, regenerating rapidly. Planted trees first flowered and produced fruits in Israel at an age of 3 years. Although widely described as a dioecious species, occasional female flowers occur among the male flowers of a few otherwise male trees. Flowering takes place in the dry season when the trees are leafless. North of the equator the fruits mature and fall at the end of the dry season as the trees flush. In the southern part of the range fruits remain on the trees longer, into the rainy season. 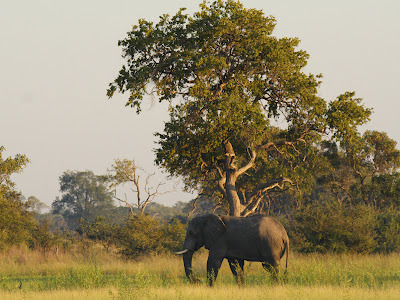 Marula is a constituent of low elevation (mostly ‹1600 m) vegetation types from tree or shrub grassland to woodland. In the drier parts of its range, marula individuals are often taller than other species growing with them. Widely spaced single individuals, retained as fruit trees when other species are removed, often characterize farmland and parkland landscapes. The species is associated with a strongly seasonal rainfall pattern. Mean annual rainfall is usually 500–1200 mm and mean monthly rainfall ›50 mm occurs in 4–7 months. Populations occur in more humid conditions (6–9 months ›50 mm; mean annual totals 1200–1600 mm) in the transition between the Guineo-Congolian and Zambezian regions and in more arid conditions (2––3 months ›50 mm; mean annual totals 250–500 mm) in the Sahelian region. Populations north of the equator occur in higher temperatures (mean annual temperature generally ›26°C) than those further south (mean annual temperature generally 18–25°C). The range within the tropics is almost entirely frost-free but populations in south-eastern Zimbabwe, and south into South Africa experience occasional frost. This is reported to cause major branch loss when severe (-4°C). Temperatures rise above 40°C regularly during April and May in West Africa and absolute maxima above 45°C (54°C in Timbuktu, Mali) are recorded from the West African part of the range. The soils where marula occurs range from basalts and basement complex rocks to Quaternary deposits, almost always described as light- to medium-textured, well-drained sands and loams. References to presence on escarpments and rocky hills underline the need for good drainage. Heavy soils are unsuitable. It can tolerate seasonal waterlogging, and experience with planted stands in Israel indicates tolerance of a salinity level of 4 dS/m in irrigation water. Although viability of marula seeds is lost rapidly in open storage, seeds store well in air-dry storage at cool temperatures. 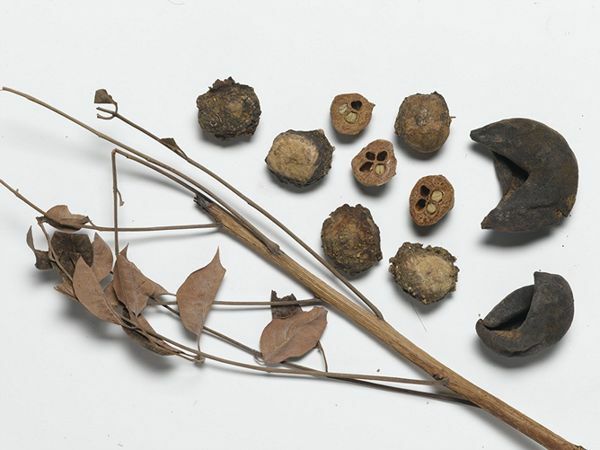 The stones (seed with endocarp) are used to raise seedlings in the nursery. Estimated numbers per kg range from 300 (Burkina Faso) to 400–500 (West Africa and Tanzania). Stones are pretreated to loosen the plugs (opercula) that close the germination apertures and allow the radicle and hypocotyl to grow out. Various methods are used. Pretreating stones by putting them in boiling water, removing the heat source and leaving them immersed for 24 hours has given 53% success (Mali). Physically loosening the plugs of freshly cleaned stones gave 70% success after one week and 85% after two weeks (Tanzania). In Burkina Faso, fresh stones are soaked in water for 48 hours before sowing into containers, giving 80% germination in 16 days, the first germination being recorded in 4 days. Nursery media recommended are 3:1:1 or 1:1:1 mixtures of earth, coarse sand and manure, and well-drained sandy loam. In Burkina Faso, the nursery period lasts 11 weeks, by which time seedlings are 20–30 cm tall. During the nursery period, watering takes place twice daily and containers are relocated (or the seedlings root-pruned) monthly. Shading is provided for 2 days after repotting or pruning. Propagation using large branch or stem pieces (10 cm × 2 cm), root suckers and grafting is also possible. Irrigated orchards of marula are maintained in Israel, water being provided every 1–2 days (summer) or every 3–5 days (winter). The most frequently reported pests are loranthaceous hemiparasites including Agelanthus crassifolius (Wiens) Polhill & Wiens, Helixanthera garciana (Engl.) Danser, Pedistylis galpinii (Schinz ex Sprague) Wiens and Tapinanthus globiferus (A.Rich.) Tiegh. Fruit pests include Carpophilus hemipterus (Coleoptera: Nitidulidae), Cryptophlebia leucotreta (Lepidoptera: Olethreutidae) and the fruit fly Ceratitus cosyra (Diptera: Tripetidae). Traditionally, fruits are harvested off the ground. The fruit falls while still green and ripens on the ground in up to 10 days, turning yellow in the process. Estimates of seasonal fruit crops from individual trees in southern Africa have been made assuming a mean fruit fresh weight of 18 g. Values per tree range from 315 kg (17,500 fruits) to 1643 kg (91,300 fruits). Fruits with a fresh weight as large as 80–100 g are known. 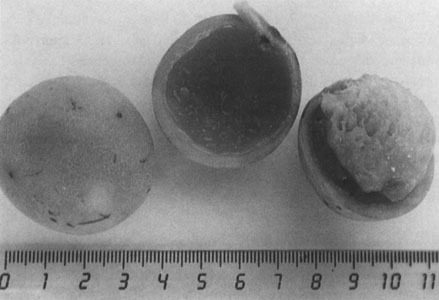 Fruit damage results from storage below 9°C, but satisfactory product quality is maintained over 14 days when stored at temperatures of 12–20°C. There are small orchards in Israel which have been established with seed from natural stands in Botswana. Germplasm from these, from additional Botswana stands, and from South Africa (Kruger National Park), was used for RAPD (random amplified polymorphic DNA) analysis. The analysis confirmed the presence of genetic differences between clones but did not indicate consistent differences between populations of Botswanan and South African origin. A recent study of 15 populations south of the equator (Namibia to Kenya) and one from West Africa (Mali) has used both RAPD and restricted fragment length polymorphism analyses. The results indicate patterns of variation both between and within populations. Clones have been selected for individual fruit size and quality and yield per tree with a view to registration as cultivars. Tree growth and fruit abscission time are further criteria suggested by experience in trial orchards. DNA fingerprints have been advocated as registerable characteristics for morphologically indistinguishable genotypes. There is continuing traditional importance of marula through most of tropical Africa and extensive scope for commercial initiatives. Investigation of genetic and product quality variation has centred on the southern extremity of the geographic range and attention to germplasm from more locations is appropriate, e.g. planned large-scale trials to be established in Tanzania. More research is needed into fruit storage procedures and the use of kernel material as a commercial by-product of fruit processing. The traditional uses of bark to treat bacteria-related diseases often have detrimental effects on marula populations. Leaf material is also useful as antibacterial agent, and the use of leaves as a more sustainable resource may be further developed and promoted. • Burger, A.E.C., de Villiers, J.B.M. & du Plessis, L.M., 1987. Composition of the kernel oil and protein of the marula seed. South African Journal of Science 83: 733–735. • Kokwaro, J.O., 1986. Anacardiaceae. In: Polhill, R.M. (Editor), 1986. Flora of Tropical East Africa. A.A. Balkema, Rotterdam, Netherlands. 59 pp. • Nerd, A. & Mizrahi, Y., 1993. Domestication and introduction of marula (Sclerocarya birrea subsp. caffra) as a new crop for the Negev Desert of Israel. In: Janick, J. & Simon, J.E. (Editors). New crops. John Wiley and Sons, Inc., New York, United States. pp. 496–499. • Palmer, E. & Pitman, N., 1972–1974. Trees of southern Africa, covering all known indigenous species in the Republic of South Africa, South-West Africa, Botswana, Lesotho and Swaziland. 3 volumes. Balkema, Cape Town, South Africa. 2235 pp. • Peters, C.R., 1988. Notes on the distribution and relative abundance of Sclerocarya birrea (A.Rich.) Hochst. (Anacardiaceae). Missouri Botanical Garden Monographs in Systematic Botany 25: 403–410. • von Maydell, H.-J., 1986. Trees and shrubs of the Sahel: their characteristics and uses. Schriftenreihe der GTZ No 196. Deutsche Gesellschaft für Technische Zusammenarbeit, Eschborn, Germany. 525 pp. • von Teichman, I., 1983. Notes on the distribution, morphology, importance and uses of the indigenous Anacardiaceae. 2. The importance and uses of Sclerocarya birrea (the marula). Trees in South Africa 35: 2–7. • Weinert, I.A.G., van Wyk, P.J. & Holtzhausen, L.C., 1990. Marula. In: Nagy, S., Shaw, P.E. & Wardowski, W.F. (Editors). Fruits of tropical and subtropical origin: composition, properties and uses. Florida Science Source, Lake Alfred, United States. pp. 88–115. • Agufa, C.A.C., Simons, A.J., Maghembe, J. & Dawson, I.K., in press. Molecular genetic variation within and between populations of Sclerocarya birrea measured by RAPD and chloroplast RFLP-PCR analysis: implications for genetic management of the species. • Aubréville, A., 1950. Flore forestière soudano-guinéenne. Société d’Editions Géographiques, Maritimes et Coloniales, Paris, France. 533 pp. • Audu, J.A., Kela, S.L. & Unom, V.V., 2000. Antimicrobial activity of some medicinal plants. Journal of Economic and Taxonomic Botany 24(3): 641–650. • Eloff, J.N., 2001. Antibacterial activity of Marula (Sclerocarya birrea (A. Rich.) Hochst. subsp. caffra (Sond.) Kokwaro) (Anacardiacae) bark and leaves. Journal of Ethnopharmacology 76(3): 305–308. • Fernandes, R. & Fernandes, A., 1966. Anacardiaceae. In: Exell, A.W., Fernandes, A. & Wild, H. (Editors). Flora Zambesiaca. Volume 2, part 2. Crown Agents for Oversea Governments and Administrations, London, United Kingdom. pp. 550–615. • Galvez-Peralta, J., Zarzuelo, A., Busson, R., Cobbaert, C. & de Witte, P., 1992. (-)-Epicatechin-3-galloyl ester: a secretagogue compound from the bark of Sclerocarya birrea. Planta Medica 58(2): 174–175. • Giffard, P.L., 1974. L’arbre dans le paysage Sénégalais: sylviculture en zone tropicale sèche. Centre Technique Forestier Tropical, Dakar, Senegal. 431 pp. • Gutman, F., Nerd, A., Mizrahi, Y., Bar-Zvi, D. & Raveh, D., 1999. Application of random amplified polymorphic DNA markers for identification of marula genotypes. Hortscience 34: 1256–1258. • Hall-Martin, A.J. & Fuller, N.J., 1975. Observations on the phenology of some trees and shrubs of the Lengwe National Park, Malawi. Journal of the South African Wildlife Management Association 5: 83–86. • Kokwaro, J.O. & Gillett, J.B., 1980. Notes on the Anacardiaceae of Eastern Africa. Kew Bulletin 34: 745–760. • Kubo, I. & Kinst-Hori, I., 1999. 2-Hydroxy-4-methoxybenzaldehyde: a potent tyrosinase inhibitor from African medicinal plants. Planta Medica 65(1): 19–22. • Le Houérou, H.N., 1980. Chemical composition and nutritive value of browse in West Africa. In: Le Houérou, H.N. (Editor). Browse in Africa: the current state of knowledge. International Livestock Centre for Africa, Addis Ababa, Ethiopia. pp. 261–289. • Msanga, H.P., 1998. Seed germination of indigenous trees in Tanzania: including notes on seed processing, storage and plant uses. Canadian Forest Service, Edmonton, Canada. 292 pp. • Perrier de la Bâthie, H., 1946. Anacardiacées (Anacardiaceae). Flore de Madagascar et des Comores (plantes vasculaires), familles 114–117. Imprimerie Officielle, Tananarive, Madagascar. 85 pp. • Taylor, F.W., 1985. The potential for the commercial utilization of indigenous plants in Botswana. In: Wickens, G.E., Goodin, J.R. & Field, D.V. (Editors). Plants for arid lands. Allen & Unwin, London, United Kingdom. pp. 231–242. • van Wyk, P., 1972–1974. Trees of the Kruger National Park. 2 volumes. Purnell, Cape Town, South Africa. 597 pp. • von Teichman, I., 1982. Notes on the distribution, morphology, importance and uses of the indigenous Anacardiaceae. 1. The distribution and morphology of Sclerocarya birrea (the marula). Trees in South Africa 34(3): 35–41. • Gilbert, M.G., 1989. Anacardiaceae (including Pistaciaceae). In: Hedberg, I. & Edwards, S. (Editors). Flora of Ethiopia. Volume 3. Pittosporaceae to Araliaceae. The National Herbarium, Addis Ababa University, Addis Ababa, Ethiopia and Department of Systematic Botany, Uppsala University, Uppsala, Sweden. pp. 513–532. • Keay, R.W.J., 1958. Anacardiaceae. In: Keay, R.W.J. (Editor). Flora of West Tropical Africa. Volume 1, part 2. 2nd Edition. Crown Agents for Oversea Governments and Administrations, London, United Kingdom. pp. 726–739. Hall, John B., 2002. Sclerocarya birrea (A.Rich.) Hochst. [Internet] Record from PROTA4U. Oyen, L.P.A. & Lemmens, R.H.M.J. (Editors). PROTA (Plant Resources of Tropical Africa / Ressources végétales de l’Afrique tropicale), Wageningen, Netherlands. <http://www.prota4u.org/search.asp>. Accessed . 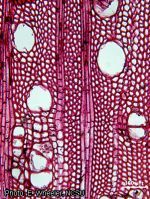 There are 22 study abstracts related to Sclerocarya birrea (A.Rich.) Hochst.. Click on "show more" to view them. There are 301 book citations related to Sclerocarya birrea (A.Rich.) Hochst.. Click on "show more" to view them. There are 371 citation in web searches related to Sclerocarya birrea (A.Rich.) Hochst.. Click on "show more" to view them. There are 198 citation in scholarly articles related to Sclerocarya birrea (A.Rich.) Hochst.. Click on "show more" to view them. There are 34 news article citations related to Sclerocarya birrea (A.Rich.) Hochst.. Click on "show more" to view them. There are 63 citations in Afrirefs related to Sclerocarya birrea (A.Rich.) Hochst.. Click on "show more" to view them. There are 14 Wikipedia citations related to Sclerocarya birrea (A.Rich.) Hochst.. Click on "show more" to view them. Aluka - Sclerocarya birrea (A.Rich.